After a battle with A.I.M. 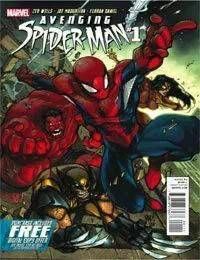 with the Avengers, Spider-Man gets Red Hulk to help him return to New York. When they arrive, they find an army of moloids attacking during a marathon. While they try to protect the citizens and reclaim J. Jonah Jameson – who had been captured during the assault – a moloid summons a subterranean beast that devours Spider-Man and Red Hulk.